The Omega-3 stabilized flax, antioxidant, and fish-oil supplement to help maintain healthy skin and coat, and top performance for dogs in all life stages. Omega Canine Shine makes a difference you can see from the inside out! The Omega 3 stabilized flax, antioxidant, and fish-oil supplement to help maintain healthy skin and coat, and top performance – for dogs in all life stages. There are natural sources of Omega-3 and antioxidants that taste great and are easy to serve. They are found in the stabilized, ground, fortified flax, refined fish oil, and sorghum used in Omega Canine Shine. Utilizing proprietary stabilization technology developed by ENRECO®, INC (Omega Fields' parent company), the powerful nutrients in Omega Canine Shine are locked in and guaranteed stable for at least 12 months -- longer if refrigerated or frozen. 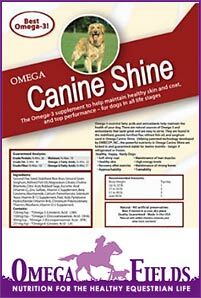 What Is The Proper Dosage For Omega Canine Shine? Feed 1 teaspoon per 20 pounds per dog weight daily, top-dressed over food. Start gradually first week, and then increase to full amount. What Are The Benefits Of Omega Canine Shine? Ordering is easy! You can order Online or give our office a call and we are happy to help you by phone. Omega Canine Shine is a product that you will come to love for it results…and for that glorious shine you can't keep your eyes off!